An old Farm with 23 hectar of land has been purchased in 1988. At that time the farm had a large apple orchard, and the plot was mismanaged for years. 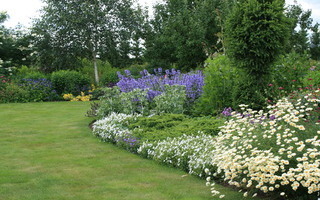 2004 the family began with the construction and design of the garden that we see right now. 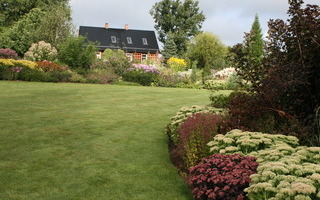 The English-style landscaped garden has about 1,5 hectars. 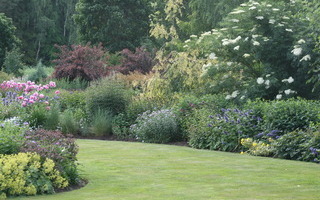 There you will find several trees, shrubs, climbers and a lot of perennials. There have been used species that are stabil, disease resistant and long-flowering. You can also find a lot of old varieties. The garden will complemented at the spring, summer and autumn with blooming bulb flowers. The garden design includes a decorative vegetable garden, shade garden, sunny perennial beds, rockery, a peat and a heather garden. The diversity extends over 2,000 varieties. 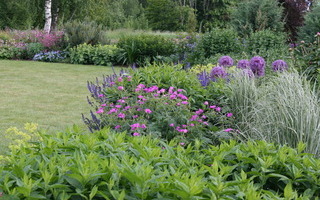 There are a lot of different Aster, Helenium, Phlox, Chrysanthemum, Coreopsis and Geranium species and varieties. 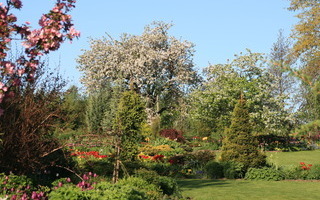 At the spring time you see a lot of tulips, daffodils and ohter naturalized bulbs. The garden is designed in the light of all the four seasons: Every season has something to look at. 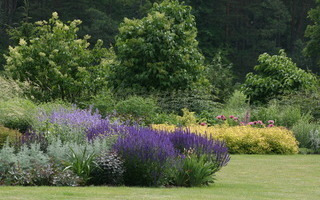 VISITOR INFORMATSION: The garden can be visited by prior agreement and open garden days. Visiting fee € 6.5 per adult, children under 16 years are free.